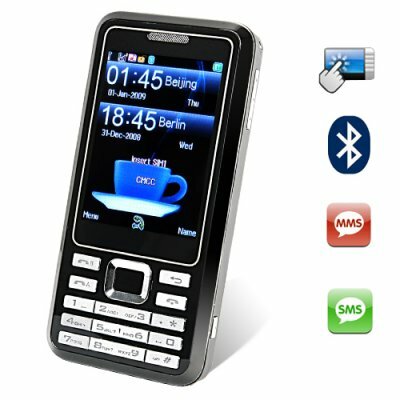 Successfully Added Mister Simple - Quadband Touchscreen Dual SIM Cellphone to your Shopping Cart. Most people love today's feature packed multimedia cell phones, right? Well, not everyone. Some people only want to make calls and send + receive text messages. For those people we offer the latest in quad band mobile phone technology but without the emphasis on media features you may not want. The phone is the M59 Mister Simple and it is for anyone who needs a wholesale priced (some might even say cheap) factory-direct and easy to use worldphone. Designed for global communication and ease-of-use, that is what this phone does best! This model does not pretend to be a television or an iPod. It is simply the best choice "regular guy" unlocked GSM cellphone that you will find on the market today, incorporating all the advances in mobile connection technology and less of the unnecessary media features. And get this - for the phone's world introduction we are including a bonus carrying case and 2GB TF card!! The Mr Simple is in stock right now in our warehouse for single piece or large bulk purchases. Order one today and we will ship it out to you tomorrow. Proudly brought to you from the leader in factory direct wholesale electronics, Chinavasion. Bonus 2GB microSD card included free! Will this phone work with my network carrier? YES. This is a four-band GSM worldphone, meaning that if you have a SIM card for a GSM phone service provider then this cellular phone WILL work for you. The back cover of the phone does not come off easily, is something wrong with my phone? NO. The Mr Simple model is designed for ease of use in calling and messaging. It indeed does have a back cover that is hard to take on and off, that is part of its basic charm. Does this phone have any games or MP3 and MP4 Players? YES. However, if you need those features in your cell phone then we suggest you get an M55 Odyssey or M56 Pegasus. The "Mr Simple" is primarily a basic calling and texting phone for the person who does not really use those types of media features regularly. Will I be able to send picture messages and use WAP with this model? Does this phone support GPRS? Yes, you can use GPRS services like MMS messaging (picture messages) with this model. Other services like WAP are dependent on your phone service data plan. In addition, there may be user required settings inputs required to make WAP internet work on your phone.